New Zealand’s climate prevented the Polynesian ancestors of Māori from growing their usual plants for making fabric. Instead they developed a rich culture of weaving, largely based on flax. They produced beautiful objects ranging from the practical (food baskets and floor mats) to the treasured and prestigious (intricately woven cloaks). When the ancestors of Māori arrived in New Zealand, they found that aute – the plant used to make cloth on Pacific islands – did not thrive in the cooler climate. They used harakeke (New Zealand flax) as the main substitute. Leaves were cut carefully to preserve the centre shoot, and were stripped to extract muka (fibre). This was washed and beaten with a stone pounder, then hand-rolled into thread. Threads were dyed yellow, red-brown or black using tree bark or mud. Other plants such as pīngao, kiekie and kākaho (toetoe stems) were also used for weaving. Weavers, who were mostly women, were taught in a special building called te whare pora. They also learnt ceremonial and spiritual aspects of weaving. Māori developed a system of finger weaving called whatu. A cord was stretched between two pegs. Warp threads hung down from the cord and finer weft threads ran between these. Beautiful kākahu (cloaks) were worn by people of rank. Cloaks included kahu kurī (dog-skin cloaks), korowai (cloaks decorated with woollen pompoms or tags) and kahu huruhuru (cloaks made with bird feathers). A fine kākahu could take several years to make. They were treasured, and were sometimes exchanged for important items or services. Tāniko is a method of decorative weaving, used to decorate the borders of garments, or for bodices, headbands and armbands. After Europeans arrived, Māori included wool, silk and cotton in tāniko. Tukutuku is a type of weaving mostly used to adorn the inside walls of meeting houses. Toetoe stems are set side by side, with wooden strips lashed in front. Coloured patterns are made by lacing through strips of pīngao or kiekie. Māori also made a range of practical objects. Whāriki is a plaiting technique used to make floor mats, also called whāriki. Raranga is a weaving style used for rourou (food baskets), kete (bags) and other small objects. Whiri is a braiding technique and whatu is an off-loom finger-weaving method, which produces strips of material for headbands, belts and ropes. Kupenga (fishing nets), crayfish pots and hīnaki (eel traps) were also made. Cloak-making and other fibre arts became less common in the early 20th century. A number of women, including prominent weavers Rangimarie Hetet and Diggeress Te Kanawa, continued to practise and teach weaving arts. In 1969 a national weaving school was set up, and a weaving revival began. In the 2000s new pā harakeke (stands of flax for weaving) had been planted. 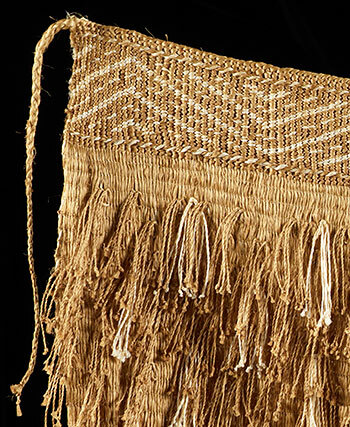 Māori weavers used new materials and techniques along with traditional ones.